Children on the second-grade level may begin to question where sound comes from or wonder how they are able to hear noises. While informing children of the basics--letting them know that sound waves move air around and reach the ears through vibration--is important, a hands-on activity often helps them clearly understand this concept. Help second graders grasp these ideas by introducing them to a variety of fun and educational sound activities. From Reeko’s Mad Scientist Lab, this easy experiment simply and clearly illustrates to youngsters that sound is just moving air. Dubbed “Good, Good, Good Vibrations,” this activity requires a 2-foot piece of string, a rubber band, a metal spoon and a table. Attach the metal spoon to the midpoint of the string, using the rubber band. Kids then wrap or tie (but not too tightly, keeping circulation in mind) the ends of the string to the index fingers of each hand and gently put those index fingers in their ears. As they stand next to a table, the kids lean toward and away from the table, causing the spoon to hit the surface. When the spoon hits the table, it causes vibrations to travel from the spoon all the way through the rubber band, the string and the fingers--those vibrations finally reach the ears, where the brain interprets them as sound. This classic activity illustrates that sound is vibrations, but it expands on the complexity of the idea while adding a musical element. The glass xylophone activity uses any number of glasses or glass bottles (scholastic.com recommends six to 18), a pitcher (or a few) of water, pencils or metal spoons and pencil and paper (to record results). Allow kids to experiment with tapping pencils or spoons on empty glasses, responding to the sounds produced. Then add varying levels of liquid to the glasses, noting how the sounds change depending on the amount of liquid. Divide children into groups, with a couple of glasses filled with varying amounts of liquid; encourage them to try varying liquid levels and create musical compositions, recording their findings on paper. Add food coloring to the liquid for variety, and try different liquids, such as juice or milk, noting the changes in tone. This activity develops creative thinking, encourages musical skills and further illustrates the concept of sound as vibrations; more liquid in the glass inhibits vibration and deepens the tone, while less liquid lets the vibrations ring free. 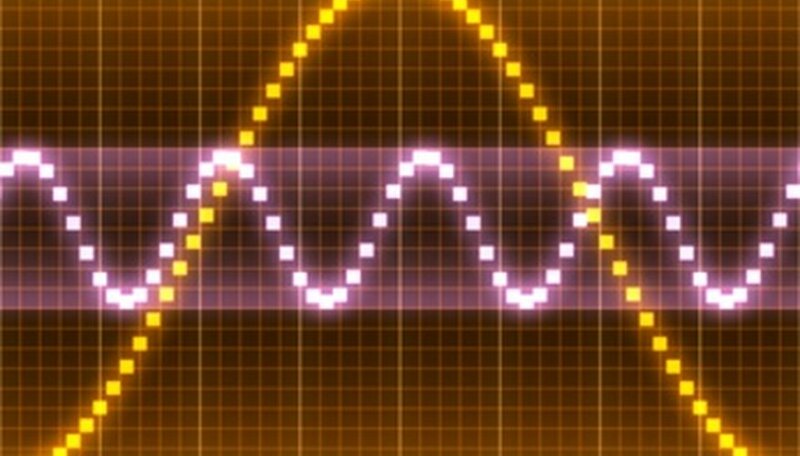 This fun, toy-based activity visually illustrates the movement of sound. Suggested by the Science Museum of Minnesota, this experiment requires nothing more than a Slinky and a few young volunteers. Two youngsters carefully stretch the Slinky out between them--resting it on a floor or table and making sure it doesn’t kink up--creating a distance of about 10 feet. The child at one end of the Slinky represents the sound source, while the child at the other end is the sound receiver, or the ear. When the sound source gives the Slinky a push, the coils of the Slinky travel to the other end of the spring, reaching the ear. This visually mimics sound waves moving through the air. Allow kids to experiment with pushing more or less forcefully (never too forcefully, of course) to represent louder and quieter sounds, and give the partners a chance at each role. Ketchum, Dan. "Science Activities on Sound for the Second-Grade Level." Sciencing, https://sciencing.com/science-activities-sound-secondgrade-level-6400841.html. 25 April 2017.